Donal Byrne of is a news editor at RTÉ who is responsible for news planning. Then that vile euphemism: Known to Gardaí. ‘Deserved it’ in other words. Derek O'Toole died when he was struck by an off-duty garda's car in Lucan Co Dublin in March 2007. Within hours of his death, and without naming their sources, RTÉ accused him of being 'known to gardaí'. It later emerged that he had no criminal record or criminal associations whatsoever, and GSOC concluded that unknown gardaí had supplied false information to journalists. 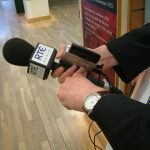 RTÉ journalism guidelines state that “We should be reluctant to rely on a single source especially if the information from that source has been given on condition of anonymity.” If what Donal Byrne said is true, it is remarkable that in both cases RTÉ and other media outlets all secured multiple sources giving incorrect but identical information within the very few hours between the death of each and the accusation being made on-air. Donal suggested that 'being criticised by both sides' was an indication that RTÉ is, in fact, objective. Leaving aside this logical fallacy, it is clear that outside RTÉ, Paul Reynolds is widely viewed as a reporter sympathetic to garda management, for example here, here, here, here and here. I said that there was a virtual news blackout on RTÉ about the case of the firing of Gemma O'Doherty, as witnessed by the Guardian, a British newspaper publishing many times more stories on the case than RTÉ. RTÉ's few stories on the case are mostly insipid bare-bones statements of the fact that a case had been lodged, and later settled, without any background or analysis. RTÉ's effective news blackout on the story itself became international news with headlines such as Ireland's media ignore Irish Independent editor's annulled penalty points and Irish investigative reporter lashes media bosses for newsroom timidity by high-profile journalist Roy Greenslade. The Guardian were by no means the only international press to cover the story, it has been carried by The Irish Post, the Sunday Times, Yahoo News and others. The Guardian and The Irish Post also reported the bombshell story that former Commissioner Martin Callanan had been called as a witness in Gemma O'Doherty case, a story that RTÉ entirely blacked out. RTÉ did, however find space to report the fact that Nanci Creedon, daughter of John, had established a dog-grooming business. The Broadcasting Authority of Ireland defines sponsorship as "Any contribution made by a public or private undertaking to the financing of television and/or radio programmes with a view to promoting its name, its trade mark, its image, its activities, its products or its services." I understand that the AA pays the salaries of the presenters and pays the rent on the studios from which they broadcast. I also understand that guests on RTÉ radio programmes, including Conor Faughnan, introduced as 'from a city centre studio' are, in fact speaking from the AA studios, in direct contravention of the BAI's total ban on the sponsorship of news and current affairs programmes. Despite what Donal said, Conor Faughnan has often been referred to as "Conor Faughnan of AA Roadwatch" on-air on RTÉ when he is campaigning against speed limits, for reducing taxes on the motor industry and for more road building, using the credibility afforded by the 158 broadcasts per week that he supplies to RTÉ. The High Court ruled in 1998 that prohibited political advertisements include "any advert directed towards: procuring changes in the laws of this country, or countering suggested changes in those laws", and the BAI make it clear that the same rules apply to sponsored programmes. The AA on its website states clearly that it is "a campaigning organisation", and often highlights its political campaigns and commercial activities. Listeners are directed to this website in each traffic bulletin. Donal disputed my assertion that the AA gets vastly disproportionate coverage on RTÉ, compared to other transport lobbying groups. At the time of writing, there are 332 pages on the RTÉ website mentioning Conor Faughnan, almost all of them publicising his lobbying activities. By contrast the Irish Road Haulage Association gets a mention on 60 pages and the Dublin Cycling campaign gets 18. These numbers are likely to change as RTÉ updates its website. I mentioned that AA Roadwatch is frequently cited in Dáil speeches, where mentions on AA Roadwatch is cited as evidence of the need for road-building. A simple search throws up many examples of this such as here, here, and here. Donal suggested that I should ask RTÉ corporately what exactly is AA Roadwatch, and I have done so. So far, I have not received any response. I will update this page if it arrives.